Does not appear to be very sharp. My old 300mm f4.5 manual lens is much sharper. Any ideas or is it just the lens? My guess is that since it's at the far reach of the zoom lens, it's not going to be as sharp as a prime. It's a very pretty shot. I used to think that getting a good pic of birds on the feeder required the use of a good zoom lens. Then I had a duh moment. 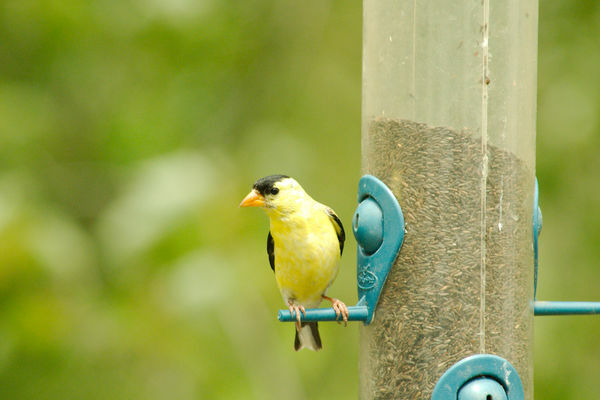 Put the camera on a tripod, with a prime lens or at the sweet spot of a zoom, about 5 feet from the feeder. Pre-focus the camera on something at the feeder, such as the feeder itself or pole. Use a wireless remote or software to snap the pics. Many modern cameras have a remote software available. For instance Nikon has Snapbridge for their more modern cameras. It allows you to see live view on your cell phone, change pretty much all of the settings, and snap a pic. Other manufacturers have similar software. Looks pretty sharp to me. Did you sharpen it a little, and or increase the contrast in PP? Yes, it was PP in Aftershot with some sharpening and contrast.